A common herbal remedy and holistic treatment, aloe vera tea has many nutritional benefits when it comes to a healthy lifestyle. Aloe vera tea comes from the sap of an aloe plant. 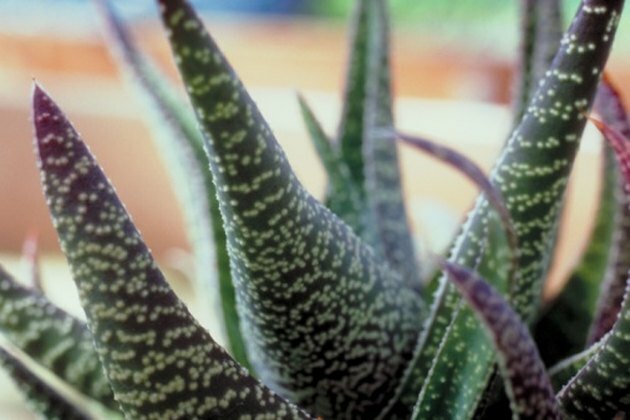 This plant grows in warm environments, and can be used to treat many things from sunburn to digestive issues. Be sure to contact your physician before taking any herbal supplements, such as aloe vera tea. Aloe vera is commonly used in its raw form by just cutting open a leaf and applying the gel inside to the affected area. To make this plant into a tea, the sap is dried and then steeped in water. Prepared aloe vera tea is often sold in health food stores by the gallon. Aloe vera tea can be used for many different ailments. The tea can serve as a wash for eyes and wounds, or to treat certain digestive disorders. It is used to treat burns and alleviate the symptoms of over-exposure to the sun by pouring the tea on the affected area. Aloe can also help treat skin conditions such as rashes or insect bites. Aloe vera has been used as a remedy for thousands of years, and is still commonly used today. constipation. Uses for aloe vera tea range from relieving constipation and treating high cholesterol and abdominal pain, to regulating blood sugar in diabetics. Along with the benefits of aloe vera tea, there are several side effects that come with consumption of the plant. Aloe vera can cause abdominal cramping and pain due to its laxative effects on the body. Although there is not enough data to conclusively prove these effects, consuming the latex of the plant has also been linked to kidney damage and miscarriages, and is listed as a possible carcinogen by the National Institute of Health's MedlinePlus. Most symptoms present themselves at high doses, or about one gram per day, according to the National Institute of Health's Medline Plus.